Welcome to Thermo Transfer, Inc. The roller hearth furnace conveys the work directly on the hearth rollers. 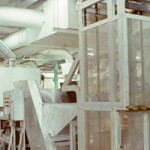 Work can also be processed in baskets or on trays which are conveyed on the rollers. Quench systems and cooling systems can also be provided. Furnaces can be designed for use with or without atmosphere. Heating systems can be direct open fired, indirect fuel fired or electrically heated. Furnaces can be lined with refractory or with ceramic fiber depending on the. . .
Thermo Transfer offers a wide range of box furnaces from a single front opening door, to a car bottom, double door and or a walk in furnace. 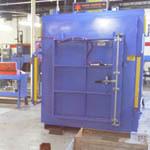 Product loads are placed in the furnace through a single front opening door. The box furnace is a process batch furnace which is designed for many uses like; Aging, Baking, Curing, Drying, Pre-Heating, Stress Relieving, Tempering. This furnace design can use air and or special atmosphere like; endothermic. . .
Exothermic Gas Generators Thermo Transfer manufactures a complete line of endothermic, exothermic, nitrogen (molecular sieve) and dissociated ammonia gas generators. The endothermic gas generators can be gas or electric heated. The exothermic gas generator can be supplied with a boiler to produce steam as well as generated gas. 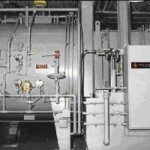 Refrigeration and dryer systems are also available for the exothermic and ammonia dissociator gas. . . The Standard TTI batch Integral Quench furnaces are designed for processes such as annealing, carburizing, clean hardening and carbonitriding. Each furnace is equipped with a variable drive recirculating fan to conserve energy. 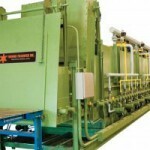 Thermo Transfer also manufactures auxiliary equipment to be used in an Integral Quench furnace line. This equipment includes draw furnaces, spray/dunk washers, charge cars, scissor-lift tables and endothermic generators. . . Continuous mesh-belt furnaces are used for hardening, annealing, tempering, and as ovens. Parts are set directly on the belt and generally require no trays or fixtures. Quench systems and cooling chambers can also be provided. 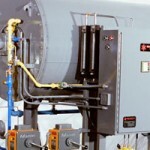 Furnaces can be designed for use with or without atmosphere. Standard capacities from 100 lbs/hr to 6,000 lbs/hr Continuous production Superior part quality capabilities Proven field reliability Maximum fuel. . .
With Capability of Providing Complete Design, Manufacturing and Installation of New Equipment We also provide repairs and modifications to your existing heat processing equipment. Thermo Transfer, Inc. can provide replacement parts for the equipment it builds, and for other manufacturers furnace and generator equipment. We can supply furnace alloy rolls and belts, refractories, heating elements, burners, control components as well as most mechanical components.